Today was one of those wonderful fall days: warm but not humid, with all the landscape refreshed from yesterday’s rain. We savor such weather at this time of year, knowing that the mild temperatures, and the plants that continue to thrive, won’t be around much longer. As I strolled around the garden, relishing the dahlias, Nicotiana mutibilis, and the summer squash that’s still producing, I found myself planning for next year. I love how the red and peach dahlias look along the outside of the vegetable garden and I want to plant more of these in Annual Alley next summer. Sure, plant in the fall. I certainly do, since my plant mania doesn’t go dormant after Labor Day. At this time of year, however, I’m also looking forward. It’s the perfect season to practice the delicate balance between being totally satisfied with how things are at this moment, while still planning and planting for the future. This is a complex state of being, filled with practice in staying in the moment, gratitude, and living with paradox. It is as rich and full as my Annual Alley. Fall is for planting and planning. Note to self: mark these red and peach dahlias so that I remember which plants to put back along this fence next year. Another note to self: try to keep my mind in the moment as I make those labels and stick them by each plant. Hear the cries of the crows, feel the warmth of the sun and the coolness of the fall breeze. 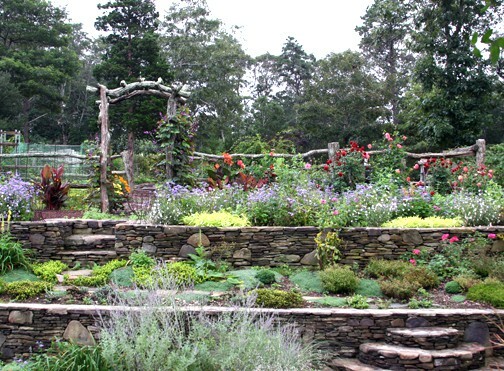 See the brilliant colors of the annuals and the vigorous ingenuity of the weeds. Be in the garden now, while working for the future.